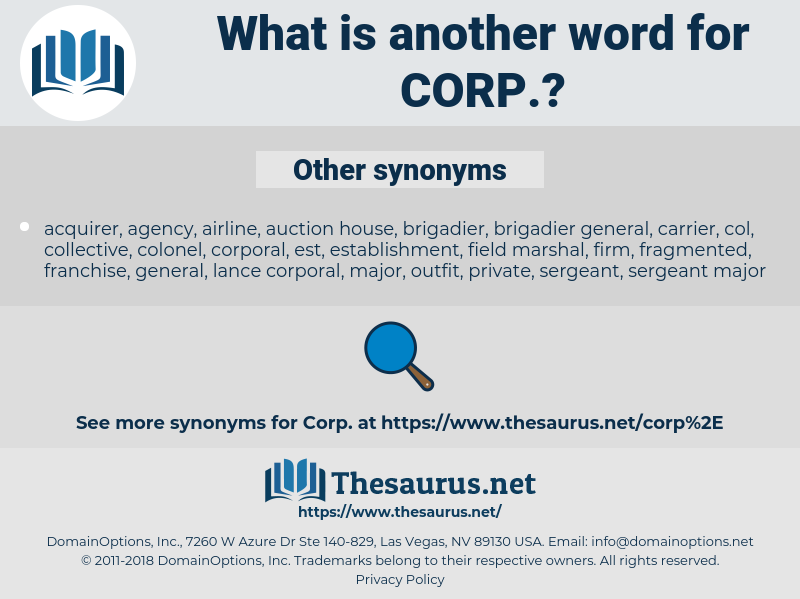 What is another word for corp? 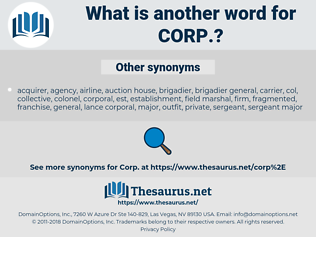 contractors, Operators, corporation, corporations, holdings, co..
croupe, crab, carve up, cheer up, cryophobia, crabby, croupy, corvee, crappie, cowherb, croup, crop, crib, chirpy, carhop, carib, chirrup, coereba, carrier wave, crybaby, cecropia, carp, corypha, cacography, crap up, crp, chirp, carabao, crave, curfew, carry off, choirboy, curb, crepe, curvy, crop up, corp., carafe, creep up, caribou, carve, curve, cherub, cash crop, creepy, carboy, caribe, curvey, crape, coscoroba, creep, cassareep, carob. fnma, shell corporation, large cap, empire, conglomerate, closed corporation, fhlmc, federal deposit insurance corporation, privately held corporation, private corporation, Freddie Mac, federal national mortgage association, small cap, Boy Scouts Of America, federal home loan mortgage corporation, fdic, Fannie Mae, close corporation, shell entity, closely held corporation.